Amid or subsequent to a period of prolonged conflict and repression, identifying and establishing the truth about events that have since passed are core components of any transitional justice strategy. In different countries and contexts, truth-seeking mechanisms have taken different forms, be they fact-finding committees, truth commissions, or commissions of inquiry. Regardless of the name they are given, the structure they take, and the scope they adopt, the purpose of truth-seeking measures is often the same: to construct a narrative about the period of conflict or repression. Effective truth-seeking measures can often be the first tool that enables a larger, far-reaching transitional justice strategy; if implemented properly and as necessary in a country context, they can play a determinative role in establishing the basis upon which prosecutions proceed, reparations are granted, history books are written, and institutional reform is planned. On the flip side, however, problematic truth seeking has the potential to do immense institutional damage. How Do Truth-Seeking Measures Satisfy Transitional Justice Goals? 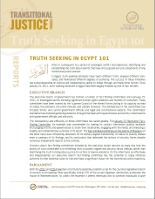 Truth seeking, which involves determining the truth and then making this truth public, is widely considered an essential component of transitional justice. Truth-seeking measures help establish a narrative of the events that took place during a period of conflict and repression, with a particular focus on human rights violations. Through this established narrative, victims and marginalized persons are provided with a space to share their telling of events, to receive affirmation of their experiences, and to heal, by reclaiming their voices after suffering severe rights violations. Through the investigative and fact-finding process, information that may otherwise have been unknown comes to light, steps are taken toward identifying violations and assigning blame for them, and recommendations are made—paving the way for additional transitional justice measures, such as reparations, prosecutions, and institutional reform. Finally, societal divisions that would otherwise fester because of a lack of transparency or a failure to recognize the reality of the past are curbed, paving the way for a process of reconciliation and national healing. What Are the Downfalls of Truth-Seeking Measures? Although properly implemented, independent, and well-funded truth-seeking measures can have a number of lasting, positive impacts on a society emerging from or experiencing conflict and repression, it is also true that truth-seeking measures are not always immune from politicization, bias, or contextual circumstances. In a period of repression and conflict from which a clear victor has emerged, there is often fear that truth-seeking measures will be biased toward findings that absolve the victor of wrongdoing. Because many truth-seeking measures are established by the victor, issues of independence come into question. In a country emerging from deep divisions, there may even be unspoken pressure on a truth-seeking measure to find results that bring about immediate peace, rather than dole out long-term justice. Additionally, truth-seeking measures can be subject to various forms of bias. The large scale of modern atrocities today often makes it difficult to fairly and comprehensively represent all citizen experiences, resulting in findings that can be incomplete or even misleading. The process of taking or giving testimony can also give rise to reporting bias, with some parties willfully dishonest or others refusing to participate in the process entirely. Because truth-seeking measures are not courts of law, their standard of proof for evidence and testimony can often be lower, thus leading some observers to call the rigor of their findings into question. Finally, truth-seeking measures that are not afforded sufficient financial resources tend to have to cut corners. Truth-seeking measures that have limited resources, for example, often fail to travel across the country to incorporate the voices of geographically marginalized victims and tend not to have sufficient time to properly advertise their existence—realities which undoubtedly affect their success. How Do We Measure the Success of Truth-Seeking Measures? When assessing the success or failure of a truth-seeking measure, one of the key factors to look into is independence—specifically, operational and financial. Other important factors to consider include the degree to which the committee or commission’s scope and mandate is properly tailored to the country context; the degree to which the state recognizes and supports the committee or commission without interfering with its independence; the truth-seeking measure’s transparency, both in the process of fact finding and in the way it releases its findings; the degree to which the measure conducts outreach with the local community, media, and civil society and incorporates marginalized voices; the degree to which the findings of the committee or commission are accepted by the local community and authorities; and the role that the truth-seeking measure plays in contributing to the larger transitional justice trajectory. International Center for Transitional Justice. “Truth and Memory.” https://www.ictj.org/our-work/transitional-justice-issues/truth-and-memory. Gonzalez, Eduardo, and Howard Varney, eds. Truth Seeking: Elements of Creating an Effective Truth Commission. New York: International Center for Transitional Justice, 2013. https://www.ictj.org/sites/default/files/ICTJ-Book-Truth-Seeking-2013-English.pdf. United States Institute of Peace. “Truth Commission Digital Collection.” March 16, 2011. https://www.usip.org/publications/2011/03/truth-commission-digital-collection.